he Davis Center is recognized as the world's premier sound therapy center and incorporates The Davis Model of Sound Intervention® as its philosophy. This model evolved from the research of The Davis Center's founder and president, Dorinne S. Davis, MA, CCC-A, FAAA, RCTC, BARA, her work with her former company, Davis Sound Research Associates, LLC and the many successes of her current company, The Davis Center clients. 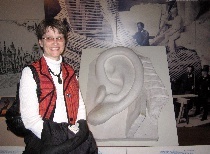 Ms. Davis has combined her 45+ years of experience as an Educational and Rehabilitative Audiologist, her experience as a teacher, with her credentials in 20 different sound-based therapies to develop the model for the current and future application of any sound-based therapy. Sound-based therapy is defined as: using sound vibration with special equipment, modified music, and/or specific tones/beats, the need for which is identified with appropriate testing. Sound-based therapy goes beyond hearing, beyond auditory processing, and beyond music. Sound-based therapy utilizes the energy of the person and supports change with the person's natural form and function by repatterning this energy. 1) There are 5 laws which connect the voice, the ear, and the brain. Summarized, the voice produces what the ear hears, and the ear emits the same stressed frequencies as the voice. If one is modified, the other changes and the brain sends the correcting response to the body. These laws are known as The Tomatis Effect and The Davis Addendum to the Tomatis Effect. 2) Every cell in the body emits and takes in sound frequencies, thereby portraying the body as one's "Signature Symphony of Sound℠ ". If there is an 'out of tune' frequency, the 'instruments (cells)' of the body are not supporting the symphony and the music is discordant. The 'out of tune' frequencies are identified. The sound is introduced to the body and the brain then introduces the correct frequency to the cell to 'tune it up'. 3) The ear is viewed as the body's global sensory processor and not just a hearing mechanism, as all of the body's senses are stimulated either directly or indirectly through the ear. Sound vibration is also processed through bone response, cell response, the nervous system, the circulatory system, and the soft tissue network of the body. The body as a whole is considered a vibrational frequency entity. The diagnosis of the person seeking to make change does not matter, for it is the sound energy patterns of the body that determine the possibilities for change for each individual. In other words, sound-based therapies force the evaluator and the client to focus on the energy patterns of the body, not the disability-neither medical nor educational. The disability or challenges that are helped by the therapies are as a direct result of the 3 key points within the underlying concepts of the process. The symptoms, disabilities and challenges are not what are addressed. Each person is helped as an individual energy entity. The Tree of Sound Enhancement Therapy® evolved as the developmental flow chart for the correct administration of any sound-based therapy. While there are many different sound-based therapies that can be administered individually with some level of success, the best outcomes are evidenced when The Tree analogy is used. 1. The "Root System" addresses one's sense of hearing. The therapy(ies) offered at this level are a form of Auditory Integration Training, which repatterns how the acoustic reflex muscle in the middle ear responds to sound, and subsequently supports the reception of sound in the cochlea. These therapies are modeled after the work of Dr. Guy Berard. The changes evidenced are a result of better sound reception. 2. The "Seed" is the foundation for all sound response in the body as it addresses our basal body rhythms, such as the heart beat or breath stream. The therapies at this level of The Tree can be utilized at any time in the person's protocol of sound therapies because these skills bring the person back into focus and keep them feeling positive at their core level. These therapies introduce rhythmical patterns to which the body responds physically and emotionally. 3. The "Trunk" addresses all responses of the ear for general sound processing stimulation, not hearing. The programs at this level are called Listening Training Programs and are modeled after the work of Dr. Alfred Tomatis. The changes evidenced are a result of the vibrational stimulation through the parts of the ear: cochlea, semi-circular canals, and vestibule, as well as the bones, circulatory system, nervous system, soft-tissue network, and cell structure of the body. 4. The "Lower Leaves and Branches" address specific auditory processing skills such as memory, sequencing, and discrimination. These skills are inherent in how the brain receives information from the auditory pathway to the brain, specifically from the cochlea to the auditory reception centers in the brain. There are numerous sound-based therapies that address these skills either in a specific skill area such as temporal sequencing, or with general overall auditory processing skills. 5. The "Upper Leaves and Branches" address the academic areas such as reading, spelling and handwriting skills, which can only be maximally achieved when the foundation of The Tree is in place. People can have these skills as splinter skills but not always process them in their entirety. The programs suggested at this level must include an auditory, visual, and language combination of instructional skills, thereby allowing for full integration of the foundational skills. 6. The "Overall Maintenance of The Tree" addresses one's wellness or body support for maintaining the learning and developmental changes obtained with the therapies at the various parts of The Tree. The Maintenance of The Tree is depicted with a head surrounding The Tree because it is the voice that reflects how the body is functioning. This surrounding head reflects the combination of the Voice, the Ear, and the Brain supporting each other for the learning and developmental changes. Currently the voice identifies the body's imbalances and then the ear sends the correcting frequency to the brain and body so that the body can make foundational change. With the advancement of Ms. Davis’ model, the voice can also be used to stabilize each person’s frequency patterns on a daily basis with the use of Ototoning. This part of The Tree can also be used as a stand alone process if one wants to address wellness challenges only. "The Tree of Sound Enhancement Therapy®" is used as the developmental flow chart for the correct administration of any sound-based therapy. However, the "Diagnostic Evaluation for Therapy Protocol (DETP®)", following this Tree analogy, is used to identify if, when, how long, and in what order, any or all of the many different sound-based therapies can be appropriately applied. Depending upon the presenting skills, either the DETP® will determine if sound-based therapies can be supportive in making positive change for the individual. According to "The Davis Model of Sound Intervention®", once the determination is made, the correct sound-based therapies are then introduced in the appropriate order. The diagnostic evaluation identifies the current issues at the time of the testing. As the person begins to make change, repeat testing is often indicated to determine if more underlying issues may be impeding the overall success of the therapies. This is an important part of The Tree process as root cause issues may be masked by the body's response at the time of testing. As the layers built up over time are peeled away, the core issues become more noticeable and then they must also be addressed. Once core issues are stimulated and enhanced, the person can begin to build their developing foundational skills. It has been consistently demonstrated by The Davis Center's clients that when a therapy protocol, based on thorough diagnosis and evaluation, is administered in the correct sequence, positive changes have resulted. Further, when a client has discontinued their therapy protocol, successes have been limited. It is, therefore, important to commit to an overall program to achieve maximum positive change. With her newest work, the identification of a new sublte energy system called the Voice-Ear-Brain Connection, her work brings us into the 21st century and the world of energy and vibrational medicine. Sound-based therapies hold great potential for making significant learning, development, and wellness changes for any individual. The paradigm established with The Davis Model of Sound Intervention℠ provides an opportunity for each person to make natural self change by repatterning their energy patterns. Her new work called Ototoning helps each person know what their body wants in that moment in time to self-heal. Her work provides the foundation for the new profession called Sound Therapist.